The suffering servant is not just Jesus; and he is not just for Christians. To the poet Isaiah’s credit, the servant has handily and deftly defied all scholarly attempts to say anything definitive about his identity. Second Isaiah’s legendary figure overflows all the boundaries we try to draw around him and bursts out of all the boxes we try to stuff him into. If we allow ourselves to get caught up in Isaiah’s poetry, each suffering person we might be tempted to discount suddenly looks different. And if we keep looking with God’s eyes, we may even see that the suffering individual carries within her or him the seeds of our own redemption. We know this. In fact, I would suggest to you that we do it unconsciously, imposing the role of, and our expectations of, the suffering servant on others. But I somewhat disagree with Dr. Erickson, I don’t think this is always to our redemption and it is often to the detriment of the perceived servant. I’ll return to this thought in a moment. The second image we are given is that of the high priest. 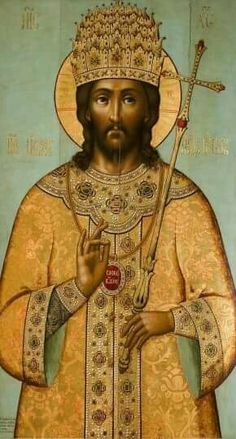 Jesus, writes the author of Hebrews, “[has] been designated by God a high priest according to the order of Melchizedek.” The cover of the bulletin this morning is illustrated with a Russian Orthodox icon depicting this text; Jesus is shown there wearing the vestments of an Orthodox bishop. Melchizedek is an obscure figure who appears in a story about Abraham in the Book of Genesis, where he is described as both a king and a “priest of God Most High.” In fact, his name means “king of righteousness.” We don’t encounter him again in scripture until Psalm 110, which the author of Hebrews is quoting, where the addressee of the psalm is understood to be the anticipated Jewish Messiah. Hebrews points to the fact that everyone involved in ministry has been in that same position of needing to own something that has gone wrong. … In current ministry, those who lead the congregation in the confession of sins include themselves among those who fall short. …the jarring contradictions between the values that leaders sometimes express and their failings to live up to those values [as something that] is true of all who belong to the Christian community. Each follower of Jesus is a flawed human being. The church continues to honor this metaphor of Christ’s ministry at the end of her liturgical year when we celebrate the Feast of Christ the King, praying that the Father will “restore all things in your well-beloved Son, the King of kings and Lord of lords.” We in this parish and in many other churches are constantly reminded of this royal metaphor (and the high priestly image) by the Christus Rex which hangs in our chancel: Jesus vested as priest and crowned as king. And sometimes our vision blurs and we confuse our clergy for Jesus. I remember several years ago when Lily I____ was just a wee, little thing, when she and her family first started attending St. Paul’s Church, she told someone in the dining room that she knew “where God was” and when asked to explain, it was very clear that she was describing not God but me. God was, she said, upstairs cleaning up the altar. Oops! The church even has a theology of the priesthood which commends this way of thinking, the idea that the priest at the altar stands “in persona Christi Capitis,” in the place of Christ the Head, that the priest is an “alter Christus,” another Christ. And we apply it in spades to our bishops! St. Ignatius of Antioch wrote that the bishop is like the living image of God the Father. Christology is a wonderful field of study and we should all be aware of the many metaphors and images used to explain the ministry of Jesus, who he was, who he is, and who he will be. But we should also be very, very careful not to let our understandings of Jesus color our expectations of those who are called to the ordained ministry. As I have been moving into retirement and moving with you into this time of transition, watching the vestry and the membership of the congregation become increasingly excited by and anxious about the process of calling a new rector, I have also been watching the calling and election of bishops in several of our dioceses. In particular, I’ve paid close attention to this past week’s activities in my son’s diocese (my former diocese) of Kansas. On Friday, my friend and colleague Cathleen Chittenden-Bascom was elected the 10th bishop of that diocese. It took only two ballots, a clear indication of the strength of her support and, we pray, of the Holy Spirit’s guidance in her selection. I received the news of her election with great joy. The perfect pastor preaches exactly 10 minutes. The perfect pastor condemns sin roundly, but never hurts anyone’s feelings. The perfect pastor works from 8 a.m. until midnight, and is also the church janitor. The perfect pastor makes $100 a week, wears stylish clothes, drives a new car that reflects well on your church, buys ten excellent books each week, and donates $80 a week to the parish. The perfect pastor is 29 years old and has 40 years’ worth of experience. Above all, the perfect pastor is very attractive. The perfect pastor has a burning desire to work with teen-agers, and he spends most of his time with the senior citizens. The perfect pastor smiles all the time with a straight face because she has a sense of humor that keeps her seriously dedicated to the parish. The perfect pastor makes 15 home visits a day and is always in the office to be handy when needed. The perfect pastor always has time for vestry or parish council and all of its committees. He never misses the meeting of any parish organization, and is always busy evangelizing the unchurched. The perfect pastor is broken enough to understand all people, but sound in mental, emotional, and physical health. The perfect pastor is always in the next parish over where your friend attends church. If your pastor does not measure up, simply add your parish’s name and address to bottom of the attached list, removing the parish at the top of the list, and send the list with this notice to six other parishes that are tired of their pastor, as well. Then bundle up your pastor and send him to the parish at the top of your list. If everyone cooperates, in one week you will receive 1,643 pastors from which to choose. One of them should be perfect. Have faith in this letter – it works. But beware! One parish broke the chain and got its old pastor back in less than three months. I copied that and put it away to share as a bit fun as we got closer to our time of separation, but I needed to pull it out and dwell on it on Friday afternoon. Not long after receiving the word that Cathy Bascom had been elected in Kansas, I received word that another friend and clergy colleague had committed suicide on Friday morning. He was a deeply loved and deeply loving man for whom, I suppose, the burden of “perfection,” of being the suffering servant, the “alter Christus,” had grown too great, had become unbearable. I understand how that can happen. Clergy often get letters, emails, and comments that are hurtful, and we often get more of those than of positive remarks. They pile up. A few years ago, an article by a high school teacher named Leslie Williamson suggested that children need to receive ten positive comments to offset just one negative criticism, and an article in the Harvard Business Review reported on the basis of research conducted with corporate executives and middle-managers that the optimal ratio of compliment to complaint in the workplace is about six to one. The church doesn’t very often get to those levels with its leadership, either ordained or lay. Christology, as I said, is a wonderful field of study and we should all be aware of the many metaphors and images used to explain the ministry of Jesus, who he was, who he is, who he will be. But we should also be very, very careful not to let our understandings of Jesus color our expectations of those who are called to minister in his Name. I have been blessed and privileged to be your rector these past almost-16 years and, as much as I look forward to retirement, I also grieve what I will be losing when we part company in about six weeks. I grieve that my friend was unable to share such a blessing in his ministry, or at least could not perceive it. I pray that my friend Cathy will find such blessing in her ministry as the next bishop of Kansas. And I pray that through the coming interim and the calling of your next rector, your vestry, your transition team, and that new priest will find it here in this place. He or she will not be a perfect “suffering servant.” He or she will not be a “high priest after the order of Melchizedek.” He or she will not be a royal messiah. There was, there is, and there will always be only one of those – that is the fundamental teaching of the church’s Christology – but he or she will be your pastor. Please love and treasure that person, and please, please let them know that you do – at least six times more often than you offer any criticism. If anything will make a pastor “perfect,” it will be that. O God of patient and gentle strength, you know our needs even before we ask: may your loving presence guide the people of this parish as they seek their next rector. Give them an open spirit, discerning hearts, and clear minds, that they may trust your will and become ever more united in your son our Savior, Jesus Christ. Inspire their conversation, deepen their prayer, and strengthen them as a community of humility and grace. Raise up for them a priest and pastor who will boldly proclaim your Gospel, faithfully administer your sacraments, and serve your people with love and compassion; and give them the grace to love, support, and compliment their new rector. All this we ask through Jesus our Lord, who lives and reigns with you and the Holy Spirit, now and forever. Amen. This homily was offered by the Rev. Dr. C. Eric Funston on the Twenty-Second Sunday after Pentecost, October 21, 2018, to the people of St. Paul’s Episcopal Church, Medina, Ohio, where Fr. Funston is rector. The lessons used for the service are Isaiah 53:4-12; Psalm 91:9-16; Hebrews 5:1-10; and St. Mark 10:35-45. These lessons can be found at The Lectionary Page. Ignatius of Antioch, Letter to the Trallians 3,1. Nicely done. May your message be heard and understood as the parish prepares for your departure and welcoming their new rector.